8/9 Cup of Coffee: The teams in the upper minors struggled as Portland was blown out and Pawtucket blew a short-lived lead late in the game, but the second DSL team went 2-0 on the day, and the GCL Red Sox earned a big win. Pedro Castellanos (pictured, right) highlighted the hitting performances with a perfect 4-for-4 day, including a home run that helped put the game away. Jorge Rodriguez delivered an unconventional complete game for DSL Red Sox2 as well in their regularly scheduled game after they completed a suspended one in the morning. The teams traded four-run eighths, but Pawtucket could not strike back to force the game to the bottom of the ninth as Louisville held on. Brandon Phillips hit 4 for 5 with three doubles while Rusney Castillo added three hits of his own. Chandler Shepherd allowed two runs on seven hits in six innings. Travis Lakins followed with a shut-down seventh, but with one out in the eighth, a passed ball followed by an error by Josh Ockimey allowed a run to score. Later in the frame, after walks by both Lakins and Robby Scott loaded the bases, old friend Nick Longhi cleared them with a double. Michael Chavis had three hits, and Chad De La Guerra had two more, but bright spots were few and far between in a complete drubbing in Erie. After Kyle Hart gave up five runs (two earned) in five innings, the wheels truly fell off. Harrison Cooney allowed six runs to cross the plate without recording an out, and Jared Oliver had five more (three earned) on his tab in 1 2/3 innings. Jordan Betts made his second pitching appearance as a position player, giving up a pair in the eighth. Jerry Downs had two hits, but the other eight guys in the lineup combined for three more as Salem dropped the middle game to Wilmington. Kutter Crawford had a quality start, allowing three runs on eight hits in six innings of work. He also struck out seven and walked one batter. Daniel Gonzalez surrendered three runs, one of which was earned, on four hits in two innings to complete the ballgame. He struck out six but allowed two home runs. Recently promoted NewYork-Penn League all-star Eduard Bazardo dominated for Greenville on Wednesday, allowing just one run in seven innings. He gave up five hits and struck out four without walking a batter. Columbia was in striking distance, down three, but a three-run eighth pushed the game out of reach. Pedro Castellanos was 4 for 4 with a two-run home run as part of the eighth inning, with Jordan Wren hitting 3 for 4, also with a two-run blast. He added a triple as well, as the two accounted for seven of Greenville's 12 hits. It was a wet one on Staten Island, as a 1:45 rain delay pushed back first pitch to 8:45, but the Spinners were able to come out with the win, despite recording just five hits. Devlin Granberg and Lane Milligan each had two hits, with Milligan adding a home run. Tyler Dearden accounted for the fifth hit with a solo shot of his own. Taylor Ahearn pitched six sparkling frames, allowing just a run on two hits. He walked one and struck out five, while Andrew Politi delivered a perfect ninth with two strikeouts mixed in to complete the ballgame. The Red Sox grabbed five runs in the fifth on the way to a dominating win, despite the bottom third of the order going 0 for 11. Elih Marrero scored three times to go along with a triple, and Brandon Howlett was 2 for 4 with a home run and five RBI. Juan Hernandez and Keibert Petit each had two hits, with Petit adding a pair of RBI. Alex Scherff pitched two innings in a rehab stint, allowing a run on three hits, striking out one. Yusniel Padron-Artiles, Connor Berry and Robert Baker ended the contest with five shutout innings. Felix Cepeda's start ended after one inning where he walked three, allowed a hit and struck out a pair and Jeison Pena picked up the slack. He went six strong frames, allowing just two unearned runs on three hits to go along with a walk and two strikeouts. 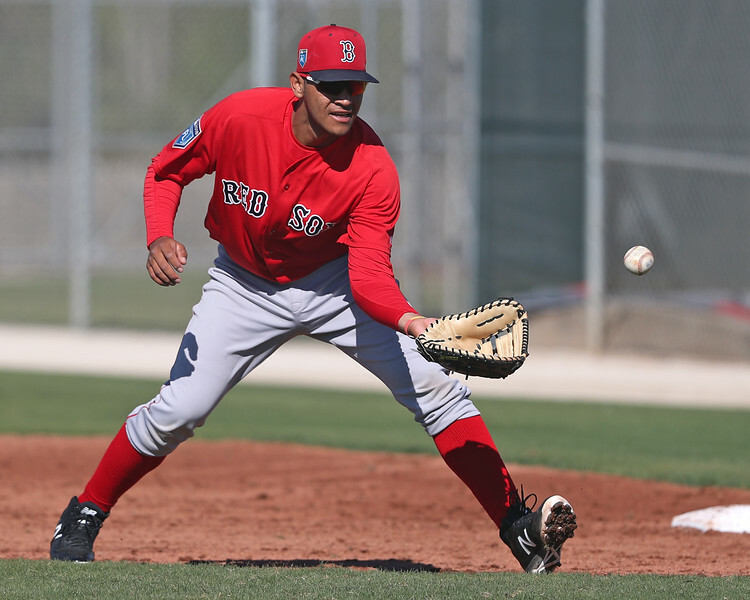 Gilberto Jiminez, Wilker Vargas, and Lewis Baez each had 2-for-5 days, with Jiminez roping a triple, but they accounted for six of eight Red Sox hits. While only four Red Sox recorded seven hits, it was enough as the Dodgers committed three errors in the completion of a game suspended back on July 23. Jorge Rodriguez delivered an unusual complete game, allowing two runs on nine hits, walking one against seven strikeouts--all over three weeks. After pitching the first four innings last month, Rodriguez re-took the mound for his regular spot in the rotation, completing his own effort. Gabriel Perez, Nelfy Abreu, and Ronaldo Pulgar each had two hits, with Perez adding a triple. Abreu, Pulgar and Oscar Rangel each had an RBI as well. In the regularly-scheduled contest, the Red Sox resisted a two-run surge from the Dodgers in the bottom of the seventh. Gabriel Quintero had two RBI, and Kleiber Rodriguez had two base knocks with an RBI as well. Brayan Bello gave his team five innings, allowing two runs (one earned) on four hits. He also struck out an impressive 10 batters. Gregoria Segovia finished it off, giving up the same two runs on the same four hits in two innings. He struck out three batters. Player of the Night: It's tough to argue with a 4-for-4 performance, especially when it includes a clutch home run late in a game. Pedro Castellanos played a key role in Greenville's win on Wednesday. He got two games in with the Drive in 2017 and has spent the entire 2018 season in South Carolina and has been hitting. His slash line was at .286/.319/.359 heading into the day and he has only struck out 34 times in 245 at-bats. The 20-year-old is on an eight-game hitting streak and has at least two hits in his last four games. He has only struck out twice during the streak.